The ancient history of the archipelago known today as "Puerto Rico" before the arrival of Christopher Columbus is not well known. Unlike other larger more advanced indigenous communities in the New World (Aztec, Inca) which left behind abundant archeological and physical evidence of their societies, the indigenous population of Puerto Rico left scant records. What is known today about them comes from scarce archaeological findings and early Spanish scholarly accounts. Today, there are few and rare cave drawings, rock carvings and ancient recreational activity sites that have been identified with some degree of speculation as to who left them behind. The first comprehensive book on the history of Puerto Rico was written by Fray Inigo Abbad y Lasierra in 1786, almost three centuries after the first Spaniards arrived on the island. The first settlers were the Ortoiroid people, an Archaic Period culture of Amerindian hunters and fishermen. An archaeological dig in the island of Vieques in 1990 found the remains of what is believed to be an Arcaico man dated to around 2000 BC. The Igneri, a tribe from the region of the Orinoco river, in northern South America, arrived between 120 and 400 AD. The Arcaicos and Igneri co-existed on the island between the 4th and 10th centuries, and perhaps clashed. Between the 7th and 11th centuries the Taíno culture developed on the island, and by approximately 1000 AD had become dominant. At the time of Columbus' arrival, an estimated 30 to 60 thousand Taino Amerindians, led by cacique Agueybana, inhabited the island. They called it Boriken, "the great land of the valiant and noble Lord". The natives lived in small villages led by a cacique and subsisted on hunting, fishing and gathering of indigenous cassava root and fruit. This lasted until Christopher Columbus arrived in 1493. 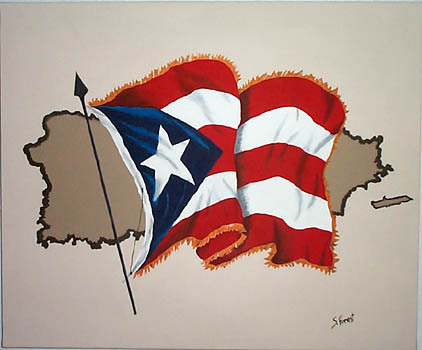 However, Puerto Rican culture today exhibits many Taíno influences within its music and vocabulary.